This Red-tailed Hawk came to us in August of 2015 with severe injuries received when flying through a methane gas plume. Because these plumes burn clear a bird cannot see them as they fly over. In addition, since raptors do not have a strong sense of smell they cannot recognize danger by the odor of the burning gas. As soon as a bird flies over one of these plumes their feathers instantly singe off and they fall to the ground like a rock. 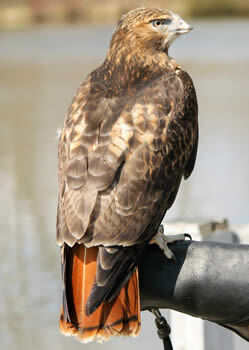 When Valerie was brought to the Center she had severe damage to her feathers from the intense heat. In addition her cere (the skin above the beak) and her feet were severely burned. Through the efforts of dedicated veterinarians and the staff at the Medina Raptor Center Valorie has made an amazing recovery. Unfortunately her beak did not regrow enough to enable her to tear food into small enough pieces to swallow so she cannot be released to the wild and will require special care for life. She has become an educational ambassador for the Center spreading her story and a message of conservation. This type injury, 100% caused by man, is not preventable. We can’t even imagine what it must be like for these majestic creatures to be flying freely one minute and falling to the ground in what must be excruciating pain the next, not knowing what happened.